Three WESTAR satellites were purchased by Western Union, one of the first applicants in the U.S. to win approval from the Federal Communications Commission to operate a domestic satellite system. 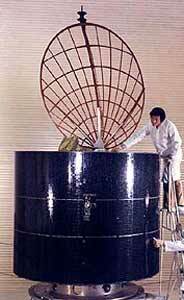 The first satellite in the system, WESTAR 1, was launched from Cape Canaveral 13 April 1974. The second satellite in the system, WESTAR 2, was launched from Cape Canaveral 10 October 1974. The third satellite, WESTAR 3, also was launched from Cape Canaveral 9 August 1979. WESTAR, built by Hughes Aircraft Company is similar to the Anik A satellites Hughes designed and built for Canada's domestic system and the Palapa-A satellites built for Indonesia. Operating in synchronous orbit, 22,300 miles above the equator, the satellites relay voice, video, and data communications to the continental United States as well as Alaska, Hawaii, and Puerto Rico. Western Union's primary earth station is in Glenwood, New Jersey, near New York City. Additional earth stations in the WESTAR system are located near Atlanta, Chicago, Dallas, and Los Angeles. Each 12 transponder satellite has a capacity of 7000 two-way voice circuits or 12 simultaneous color TV channels. Design lifetime in orbit for each satellite is 7 years. Launch vehicle for WESTAR was the three-stage Delta-2914 with nine strap-on motors. The launchings were conducted by the National Aeronautics and Space Administration under a contract from Western Union.